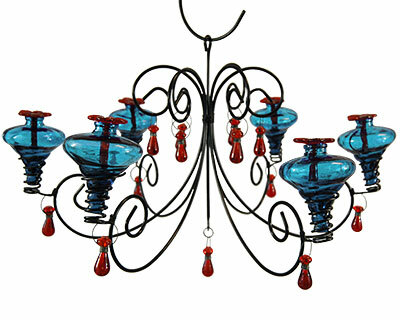 Brighten your day by seeing a wealth of hummingbirds dine from this Parasol Aqua Grand Mini-Blossom Chandelier. This generous station brings drama and old world charm to your garden at once, with its curved frame and bold, aqua colored glass vessels. Scrolls at both the top and bottom of the six metal arms evoke a chandelier, and red, glass droplets hang from this frame to further the look. A spiral holder completes each arm, and perfectly supports one of the included, aqua vessels. Each reservoir holds 4 ounces of nectar, and a red, blown glass flower at the top creates a natural feeding position for your hummingbirds. Unscrew the vessels from their holders to clean and refill them, keeping your feeding station both fresh and safe for the birds. Hand blown from recycled glass, each vessel and flower aid in reducing landfill waste, while retaining some of the artisanship of their creator. An included, black metal hanger allows you to display this item on a hook or branch with ease, and the matching black color of the metal body lends a classic hint to your yard. Add a dazzling feeding station to your bird garden with this Aqua Grand Mini-Blossom Chandelier.